Gearheads come in all shapes and sizes. Luckily we all share the same obsession with a love of engines. Here's ten ways you suggested to pick one of our own out in a crowd. This is Answers of the Day — a feature where we take the best ten responses from the previous day's Question of the Day and shine it up to show off. It's by you and for you, the Jalopnik readers. Enjoy! 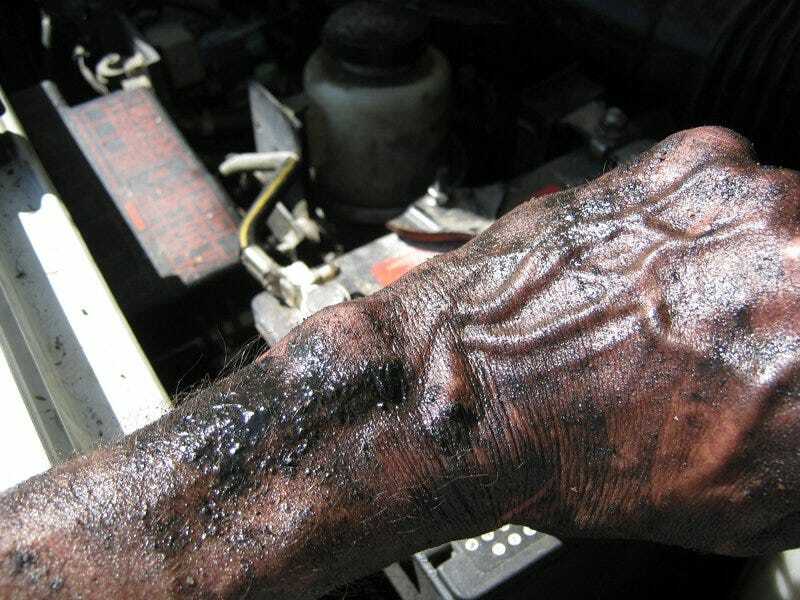 How You Know: If your hands are perpetually covered in a layer of grease and blood and you've got an entire drawer devoted to grease-spotted work t-shirts, you may be a Gearhead. No matter how hard you scrub, that badge of honor ain't goin' nowhere. Don't worry about it. It'll identify you to other like-minded souls, instantly granting you access to the Gearhead Brotherhood. How You Know: Whether it's as simple as changing a wiper blade, headlight bulb or oil, or as complicated as rebuilding a transmission, working on your own car can be rewarding and fun! Or time consuming and frustrating. Or all of the above. But just getting down on your back underneath your car means you care enough not to hand off your problems to Joe at the local Aamco. How You Know: It becomes a home-away-from-home. You know where to look for that one part that you can't find anywhere else. You're ok with laying on your back, in a small swamp, in -10 degrees or 100, to find that one thing that you need to finish your long-term project or quick weekend fix. You've got your home toolkit and your junkyard toolkit, and know that you're going to have to be quick with it to beat the other scavengers to the prize. Bruised knuckles and bleeding hands are no big concern, as long as you've gotten what you came for. How You Know: Knowing part numbers for your '83 Mustang or who won Le Mans in 1962 is all part of the game. Identifying the correct year of an MGB from looking at the badges on the back is good, but try knowing the options a 'Cuda came with from the factory from looking at the VIN. You don't have to know everything about every car, but if you've got a favorite then the extent of your knowledge is probably pretty deep. How You Know: Sure, you may not know how to do an oil change, and wiring diagrams scare the hell out of you. But you go to car shows, snap your head around on the street at a burbling exhaust, and spend your weekend watching races. It's ok if you have to take your ride to a mechanic, because the bug has still bitten you. Mechanical inclination does not necessarily a Gearhead make. How You Know: Have they taken over the floor yet? Boxes in the basement or attic? Or do you choose to embrace them, like my dad, and display them prominently in the family room? Wherever they are in your home, the mere presence of old car magazines shows that you need a reference library at hand at all times, and that's the key. Baby Beater Benz understands: "These archives, while only 15 years of each at the start, have moved from Dallas, to Irving, TX, to 9K of elevation in Colorado (two different houses), to Portland, OR, (three different places), to storage in central Texas, and finally rest in a closet in our new place in Fort Worth." That's a labor of love, folks. How You Know: Or guy. Whatever floats your boat. Point is, your priorities are in order. There will always be someone who doesn't understand, doesn't want to understand, will never understand why you do what you do. And when the time comes, you have to make a choice. It'll probably be the one with four wheels. Never look back. How You Know: Everything will fail at least once during the time you own the car, no matter how well-loved it was before you. At any car-guy meeting, owning an Alfa immediately validates your presence. Whether it's a guibo joint or the whole wiring system, you'll get to know it intimately during your time with the car. And you'll do your best to keep it running while it's in your care, because that's the right thing to do. How You Know: A clutch on the kitchen counter, a transmission in the bathtub. As long as you're still eating & cleaning yourself, we know how beautiful some car parts are. Some may be mistaken by those not in the know as modern art. That's ok, they don't know how to change their oil or drive stick, either. Let them have their fun. We all know better. How You Know: This is a requirement. I don't know a single Gearhead or car-guy who was not in some way influenced by their father, older brother, uncle, or grandpa. I don't know if it's genetic (probably) or environmental (undoubtedly), but I know I wouldn't have turned out like I am if I wasn't surrounded by books, posters, magazines, models, photos and someone to explain it all to me at a very young age.